So Uncle Woy (Roy) has given us dear fans something to discuss in tonights pubs up and down the country. He has announced the England squad capable of bringing us home the Euro 2016 Trophy! some raised eyebrows of the missing few and the inclusion of others. Rashford has been included in some ways similar to the inclusion of a 16 year old Walcott in the 2006 World Cup after no premiership appearances. Yet Rashford has been chosen, has scored and appeared in a few, but is this too early for him also? Can he carry the mantle of a striker for England with England’s fans and in the shadow of Vardy and Kane? Other issues for me personally and quite a few others are those of Henderson, Sturridge and in particular Wilshere who I don’t think has played a full game this season! Other concerns on a performance level are those of Stones and Barkley and of course Rooney who hasn’t exactly lifted the Man Utd fans to ecstasy this season! Sturridge has got to be able to do 90 minutes for at least the remaining friendly against Portugal to ensure his match fitness for the tournament, anything less and he will be a bench warmer. The same can be said for Henderson and Wilshere. In their time both can be excellent stalwarts but without game time they are going to be looking for shadows in this tournament! There are also surprise exclusions of Drinkwater who has had a stormer of a season, Townsend, despite being relegated his form in the last several matches has been MoM quality with goals and assists, and Noble who hasn’t even been considered. 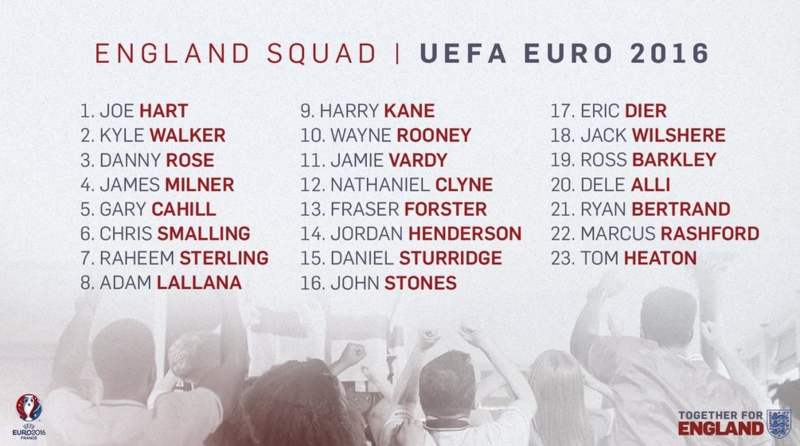 So it remains to be seen whether this is the team to beat the best in Europe and if Uncle Woy will have the last laugh as he walks through Heathrow Arrivals with a coy smile and a trophy!